This post completes the Saga of Jim Fisk. The earlier installments comprise posts 61, 63, 66, and 67. Fisk appears earlier in posts 44, 45, and 46, dealing with the Great Erie War of 1868, when Fisk, Gould, and Daniel Drew fought Cornelius Vanderbilt for control of the Erie Railway, a struggle that combined drama with farce. Editor Horace Greeley disliked Jay Gould, loathed Jim Fisk. How could he not loathe the high-living fat man who was his opposite, Greeley being a perennial critic and crusader, an advocate of a milk and Graham cracker diet, shuffling in a country hat and floppy trousers, inveighing against drink, tobacco, dancing, and divorce? The same fervor that kindled his rebukes of Erie management sparked his tirades against Fisk’s imports of light opera, which he saw as an extension of French theater, that shameless expounder of the fine art of adultery. He was determined to make his Tribune the nemesis of Erie. Editor Greeley in his office. Fisk’s influence was pernicious and inescapable, he told the Tribune staff. If people were so misguided as to want to see the latest Offenbach opera, they had to go to Fisk's Opera House, and even if he wasn't in his box, all those frescoed nudes and chandeliers and thingamabobs proclaimed his grandiose offensive bad taste. If you wanted to go to Boston via Fall River, or in season to Long Branch, you had to take one of his steamboats, with egregious plush furnishings and an outsized portrait of the rogue himself. Strolling on the Fifth Avenue, you risked meeting him strutting in front of his band. And if you took refuge in the Park, there he was chortling and hallooing in a fancy rig, running wild with loose women. Half the town loved him and half hated him; the man didn’t care which, as long as he was the center of attention. In all but name, he had made this city Fiskville. On November 25, 1871, the long-heralded case of Mansfield vs. Fisk – the libel suit, not the action to snag fifty thousand dollars – came up before Judge Bixby at the Yorkville Police Court on East Fifty-seventh Street. The packed audience had scratched and shoved to get in, one woman fainting and an elderly gentleman having his pince-nez shattered in the process; the police intervened to keep order. Pencils poised, the press were out in force, the Herald chronicler eager to recount, now in Roman mode, the exploits of Caesar Fisk, Mark Anthony Stokes, and Cleopatra Mansfield, while the Tribune scribe prepared to pillory Antichrist. Necks craned as the principals assembled. The Herald man was scribbling images already: Fisk’s stickpin “shone out of his fat chest like the danger light at Sandy Hook bar,” while Stokes’s diamond pinkie ring “glowed like a glowworm in a swamp.” Prince Erie was wearing his admiral's uniform, but his face was grim, his mustache waxed to a point, while Stokes, attired in an Alexis coat of dull cream color (the latest latest style) and polished black boots, sat stiffly, swinging his cane nervously between his knees as he waited for the proceedings to begin. Watched by all, Miss Helen Josephine Mansfield took the stand in a black silk dress with flounces, veiled, her bosom snowy with lace, and wearing a jaunty Alpine hat with a feather. Showing poise that almost masked the hurt in her voice, she testified how Mr. James Fisk, Jr., had libeled her and Mr. Edward S. Stokes by accusing them of trying to blackmail him by means of his letters; her good name had been sullied. Then Fisk’s attorney, armed with information newly acquired by his client, closed in. Miss Mansfield winced, paled. Her attorney protested vigorously: “The witness’s veracity is not to be confused with her chastity!” Amid snickers from the audience, the judge allowed Fisk’s attorney to proceed. He repeated the question. "During the day it was used as a sort of rendezvous by the officers." "During the night only by yourself and Colonel Fisk?" "Yes, that is all, I think." On the stand for three hours, she maintained her poise, but when she left the stand, it was clear to all that she and Stokes had indeed been conspiring against Fisk. At Christmas Jim Fisk went to see his wife Lucy in Boston. (Yes, he had a wife. If followers of this blog have forgotten her, so at times did Fisk himself.) Lucy was back from Europe now; had the scandal reached her ears? Though he dreaded it, he had to confess. He did, portraying Josie as a venal wanton, himself as a pliant fool. His jenny wren was shocked. How could her boy have done this? Jim Fisk wallowed in contrition, declaring himself unworthy of her forgiveness. Though a stranger to motherhood, Lucy Fisk brimmed with maternity. Of course she forgave her little boy. He'd done a bad thing, but he hadn't been happy, had he? She soothed him, reassured him. Jim Fisk left Boston forgiven, but troubled. He had destroyed Lucy's calm of innocence with the hurt of knowledge. Would she ever be the same? DOWN WITH THE ERIE ROBBERS! screamed the Tribune, insisting that Fisk’s letters contained sufficient evidence to send all the Erie rogues to prison. With shareholders up in arms, tracks broken, trains derailed, and his partner’s private life destined for further exposure in the courts, Jay Gould went to Fisk again, determined to set the Erie house in order: Fisk had to resign as vice president of the railroad. Choking back tears, on the last day of the year he did so; Prince Erie no longer. That same day an Erie engine jumped the track near Hackensack, crushing the fireman’s foot, and another gold speculator brought suit against Fisk and Gould for fifty thousand dollars. On January 6, 1872, the case of Mansfield vs. Fisk came up for its second hearing. Fisk himself was not present, since his testimony was scheduled for a later session, but the plaintiff was very much there, in a velvet jacket over a dress of black silk. Stokes was also on hand in an elegant coat, his boots polished, but looking worried, as Josie took the stand again and was subjected to ruthless questioning by Fisk's attorney. As the examination continued, her poise crumbled, her voice faltered: she had no recollection of this, denied that, never tried to blackmail Mr. Fisk. Her own testimony revealed her as a scheming doxy older, crasser, and greedier than Fisk had ever dreamed. She left the stand in tears. Her cousin Marietta Williams took the stand briefly to defend the respectability of the Mansfield household, where she also resided, then was questioned by Fisk’s lawyer about Miss Mansfield’s character. “Her general habits – ” she began. The spectators roared, Stokes glared, and Josie buried her teary face in a handkerchief. When Stokes took the stand in turn, he insisted that his friendship with Miss Mansfield was platonic. When he called on Miss Mansfield, her cousin always sat between them. Further questioning completed the portrait of Stokes as little more than a fancy man sharing with Josie the bounty she had wheedled out of Fisk. When the court adjourned for lunch, Stokes stepped down from the stand, nerves shaken, his delicate being spiked on barbs of scorn. One of his lawyers pulled him aside and informed him that the case was hopeless and had to be dropped. Fighting off the sting of despair, Stokes let his lawyers whisk him off to Delmonico’s for oysters and ale. There they were greeted by Judge Barnard, who informed them that a grand jury had just indicted Stokes and Josie for attempting to blackmail Fisk. The young man's rage seethed, his features tightened. Getting word at his Opera House office of the morning's court proceedings, James Fisk, Jr., washed at his nymph-adorned marble-and-porcelain washstand, stopped at the Opera House bar for a lemonade, and went forth by carriage in a silk hat and scarlet-lined cloak, diamonds ablaze, savoring a taste of triumph. Having decided to visit the widow of an old friend whose family he was helping financially, he shouted the address to his coachman in a voice that anyone in the vicinity could hear. Stokes was in the vicinity. Astonished, Fisk froze: a perfect target. A bullet burned his arm, another ripped his stomach; he wailed, staggered, grasped the handrail, didn’t fall. As Stokes fled into the hotel, people flocked to the downstairs entrance, helped the wounded man up the stairs through a lingering smell of gunpowder, and deposited him in an empty room with a bed; a doctor was summoned. Outside, the news raced through the streets, rippled the length of horsecars, splashed into restaurants and shops. Barbers paused, razors held in midair above their lathered customers; bellboys blurted it to managers; at the Opera House, clerks gasped, dancers wept. While newspapers stopped their presses and began writing the biggest story in years (“He can’t even die quietly,” muttered Greeley), armies of lawyers wondered how this would affect the reams of red-taped documents wedged in cubbyholes in roll-top desks. 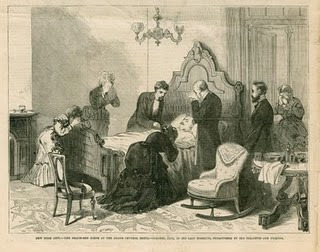 In room 213 of the Grand Central Hotel, while police and reporters flocked outside, the house physician dressed the arm wound, probed the stomach wound, couldn’t find the bullet, gave him a brandy and water. “Colonel, you’re not going to die tonight, and not tomorrow either, I hope.” His voice held scant assurance. More doctors came, gave him chloroform, probed deep for the bullet, couldn’t find it in the mass of his flesh. “For God’s sake, send for Lucy,” he gasped; they did. Arrested on the hotel premises by bystanders, Stokes was brought in, mute, rigid, glaring. Fisk looked: “Yes, that’s the man who shot me.” They took him away. “Like a little boy who’s run away from school and eaten green apples. I’ve got a bellyache.” They gave him morphine. Jay Gould, his features rarely warped by sentiment, arrived, looked at his only friend, sat tensely in an adjoining room with others, bowed his head, burst into sobs. Locked in a cell at the Tombs, Stokes lit a cigar, flung it away, lit another, flung it away, lit another. The press kept watch all night while he rallied, sank. “I’m not afraid to die,” he whispered, as doctors, friends, brass bands, and champagne and pickled oysters at Delmonico’s fuzzed into a haze, and the haunting silence that he had always dreaded loomed. A little boy groping through a cold mist, alone; terror, then a warming presence. Toward dawn Lucy Fisk had arrived from Boston, found him in a coma. She sat with him for hours, soothed him, held his hand. Gently, he died. She kissed him, wept. Gotham and the nation were shocked: Colonel-Admiral James Fisk, Jr., impresario and Prince of Flash, had bounced into the void. At the Tombs Ned Stokes, in a velvet dressing jacket and silk socks, fought off bedbugs, dined on catered veal. Lynch talk surfaced among Erie employees and the men of the Ninth Regiment; two hundred and fifty policemen guarded him, with a squad at Josie Mansfield’s. In the vast marble lobby of the Opera House the colonel, a pudgy veteran of Wall Street and boudoir battlefields, lay in state in his blue uniform, gold-laced with red epaulets, his regimental sword at his side, as hundreds filed by to pay their respects. “Once more, dear friend, for the last time,” said his barber, who, touching the waxed ends of the colonel’s mustache, gave them an expert twirl. The rosewood coffin was closed. With muffled drums the teary-eyed Ninth Regiment – hoarding memories of beer-spouting Opera House parties with high-kicking dancers, hosted by the braidiest, craziest, rip-roarin’est colonel in the world – bore forth the coffin followed by a riderless horse, stirrups reversed, plus six colonels and a general in black-draped, solemn pomp. It would have made him proud. Multitudes watched, the crush so great that five ladies fainted. “A friend of the poor,” sobbed a waiter girl. “A bully boss,” said a tough. At the New Haven depot they saw him off on a Brattleboro train furled with smoke and crepe. Was his funeral the last caper of a master of surfaces and fun? Had he learned from his hurt? Had he left on the witnessing world any more meaningful impression than the glint and flickerings of Flash? The city didn’t know, but having lately called him rogue, lecher, thief, it missed his whistle and shine. A week after his death, Fisk's letters to Josie were finally published by the Herald; they revealed nothing about Erie corruption. Bogus biographies of both Fisk and Josie also soon appeared. Two hundred and fifty of Fisk's canaries were sold at auction. His fortune turned out to total a mere million, much of it having been gobbled up by legal expenses. In Brattleboro the citizens put up an impressive cemetery monument adorned with -- appropriately -- four scantly clad young women representing railroads, shipping, trade, and the stage. Edward S. Stokes was tried for murder, but claimed that he had shot Fisk in self-defense, since Fisk had whipped out a pistol and meant to shoot him; Josie Mansfield appeared for the defense. Though witnesses for the prosecution testified that Fisk owned no guns at all, the jury could not agree. At his second trial Stokes was convicted and sentenced to be hanged, but he won an appeal and was tried a third time, convicted of manslaughter, and sentenced to six years in prison. He served four years at Sing Sing, where influence got him lenient treatment, before being released early for good behavior. He was an outcast at first, but the proprietor of the Hoffman House, a loyal friend, gave him a room there and took him in as a partner. He was often seen there at the bar, where a famous painting by the French artist Bouguereau, Satyr and Nymphs, was a must-see for visiting gentlemen. He later quarreled with the proprietor, was involved over the years in various shady enterprises, and died in New York in 1901. He evidently had a wife who divorced him. At the time of his death he was living with another woman who claimed that they had been secretly married a year before. Vilified in New York, Josie Mansfield left the city and, like many an American exile, took up residence in Paris. In 1891 she married an expatriate American lawyer in London, but later divorced him and returned to America. In time she went back to Paris, where she died in 1931, having survived Fisk by almost sixty years, and was buried in Montparnasse Cemetery. The funeral was attended by two servant women and an unidentified third mourner. Returning to Boston, Lucy Fisk frittered away in bad investments and unwise loans what she had inherited from her husband, and lived from then on in modest circumstances. She died in Boston in 1912 and is buried with her husband in Brattleboro. So all these people once closely associated with Colonel/Admiral Prince Erie Fisk ended their days shabbily and died obscurely. None of them seems to have had the knack of living meaningfully and well. Jim Fisk's story cries out to be told -- and retold. It's throughout the blogosphere, there have been biographies and a song, and even an unmemorable 1937 Hollywood movie, The Toast of New York, with Edward Arnold as Fisk, Frances Farmer as Josie, and Carey Grant as a character who, in an unlikely combination, seems to combine Stokes and Gould. Playing fast and loose with historical fact, the film was a commercial flop and lost $530,000. Daniel Meek played Dan Drew. Writers have conceived of Fisk's saga as a musical, though none has been produced to date. I know, having once entertained such a folly myself. My only comment, in retrospect: Yuck! (I have another idea for theater -- not a musical -- as well, but more about that another time ... or maybe never.) With Fisk, one major problem is casting. Lots of actors and actresses could do Josie, Stokes, and Gould, but who could do Fisk? I remember Edward Arnold as a splendid character actor in films, but I can't imagine him -- or anyone -- as Fisk. A pity. Jubilee Jim would so relish the thought of getting still more attention! Source note: For information on Jim Fisk I am especially indebted to W.A. Swanberg, Jim Fisk: The Career of an Improbable Rascal. Anyone wanting to know more about Fisk should read this very readable biography. Note on the Gay Pride Parade: Last Sunday, a warm, humid day with a threat of rain, was, of course, the annual day of craziness. As usual, our friend John came to share some wine and cheese with Bob and me, after which John and I went out to lunch. We went to our favorite Chinese restaurant, the Empire, on Seventh Avenue just below Greenwich Avenue, avoiding the nearer restaurants because they would probably be jammed. The streets were crowded and the police were out in force directing traffic, but we got our usual ground-floor table by a big window that let us watch those going to and coming from the parade, a spectacle almost as colorful as the parade itself. When we left the Empire it was jammed, with people waiting near the entrance for a table, and outside were two gay guys with outsized fuzzy-wuzzy hairdos, one bright yellow and one bright pink. It was beginning to rain lightly, but we went down Seventh Avenue toward Christopher Street and the parade, whose floats we could seeing passing in the distance to clamorous acclaim, and whose sounds drummed in our ears. On all sides, rainbow flags (small ones stuck in hairdos) and rainbow shirts and T-shirts, blatant colors, and memorable messages on T-shirts: two lesbians walking hand-in-hand with identical T-shirts: I'M HERS and I'M HERS; a gay guy: IT GETS BETTER (the message of older gays to young ones still in school, where peer-group pressure weighs heavily and bullies harass them); and another lesbian: BAM/WOW. As we got near Christopher Street the crowd on the sidewalk was jam-packed, so we decided we didn't need to see more, having watched the parade often in years past. The mood generally was upbeat and celebratory, innocently wild, nothing nasty or confrontational. Back in our apartment, Bob and I anticipated whoops and shrieks into the night, since celebrations don't die fast; it is, after all, only once a year. New York? No, Tel Aviv, June 2013. Coming soon: Next Sunday, Me and the Seven Deadly Sins, with a glance at this sinful city and the nation, too. After that, Trees on the following Wednesday and something else on the following Sunday. Meanwhile, Happy Fourth to all!